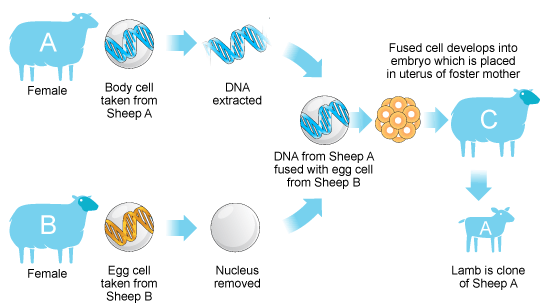 The diagram shows the process by which sheep embryos are cloned. The diagram illustrates the process by which a lamb is cloned from two individual sheep. Overall, there are several stages ranging from egg and cell removal to fusion and surgical placement, which finally results in the birth of a baby lamb. To begin with, two separate cells are taken from two female sheep; an udder cell from the first sheep and an unfertilized egg cell from the second one. After the nucleus of the egg cell has been successfully removed, the udder cell is fused with the empty egg cell using a shock of electricity. Following that, the newly fused cell then divides normally into an embryo which consists of several cells. Once an embryo has fully developed, it is surgically implanted inside the uterus of a surrogate ewe. After implantation, the newly implanted embryo develops as expected into a regular lamb. When it is born, the resulting lamb is a clone. State the range of key activities. Passive tense is used throughout because we don’t know (or it’s not important) who the doer or the subject of the action is. Describe the first action with two actions that occur simultaneously. When the previous action has been completed, a shock of electricity is used to fuse both cells together. On the outcome of the first stage, the second stage can be completed. This is done to give the impression that it takes time for each stage to be completed. Try to think of other synonyms for key words in the diagram, especially nouns and verbs. “placed in” can be substituted for “implanted.” Similarly, ”foster mother” can be replaced with “surrogate mother.” customers. The diagram illustrates the process which a lamb is clone from two individual sheep. Overall, their is several stages ranging from egg and cell removal to fusion and surgical placement, which finally result in birth of a baby lamb. To begin with, two separate cell is taken from two female sheeps; an udder cell from the first sheep, and a unfertilized egg cell from the second one. After the nucleus of egg cell has being successfully removed, the udder cell fuse with the empty egg cell using shock of electricity. Following that, newly fusion cell then divides normally into a embryo which consist several cells. Once an embryo has fully developed, it is surgically implanted inside the uterus of a surrogate ewe. After implant, the newly implanting embryo develop as expected into regular lamb. When it is born, the resulting lamb is clone. To begin with, two separate cells are taken from two female sheep; an udder cell from the first sheep, and an unfertilized egg cell from the second one. After the nucleus of the egg cell has been successfully removed, the udder cell is fused with the empty egg cell using a shock of electricity. Following that, the newly fused cell then divides normally into an embryo which consists of several cells.